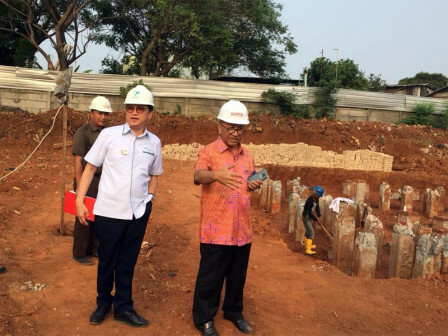 Around 784 poles of houses from zero down-payment housing projects in Klapa Village, precisely on Jalan Haji Naman, Pondok Kelapa Urban Village, Duren Sawit, East Jakarta have been installed.
" Of 980 poles, 784 out of them have been installed"
PD Pembangunan Sarana Jaya President Director, Yoory C Pinontoan disclosed that the project has entered the sub-structure stage, namely the installation of a pole. "Of 980 poles, 784 out of them have been installed," he expressed, Tuesday (8/14). It is targeted to be finished in the forthcoming September. In January 2019, the installation of the building roof up to 20th floors should also be finished. PT Totalindo CEO, Donald Sihombing added that the phase I project will be developed on a 5,686-square meter land with a 21st-storey tower and 780 houses by spending Rp 158 billion. "To get the target, after August 17, we will speed up the project," he said.